There are dreams that won't let you go. You leave a dream in the middle of the night and go to the bathroom - and as soon as you are back in bed and close your eyes, you are back in the same dream, and the action continues. You wake up again. This time you make a definite break. You might get a snack, read or watch television, or step outside and look at the moon. You go back to bed again, and as soon as you close your eyes, you are back in the same dream. This happened to me overnight. Though multiple awakenings, I found myself returning, again and again, to an adventure unfolding in Japan. I don't think I was my present self. At any rate, I was much younger. A Japanese magnate and his beautiful assistant were trying to recruit me for a certain project. The technology involved was beyond anything I know about, but perhaps quite plausible. they explained it to me as "making fire from water" and demonstrated by using a few drops of fluid to fuel a heavy vehicle that raced to the top of a mountain. One of the executives confided, over dinner, that the greatest resource of the company is "imagination" and that is why they were talking to me. Intrigued, I made no attempt to get away from the dream. Towards the end of the night, I lay in horizontal meditation, hoping that more of the plot would be revealed, since I might have the makings of a story here, of a kind that H.G,Wells might approve. In one of his most masterful short stories, Wells gives a darker version of a dream that won't let you go. In “A Dream of Armageddon”, a white faced stranger on a train – a solicitor from Liverpool – strikes up a conversation with the narrator when he notices that he has a book about dreams. "Isn't there something called consecutive dreaming - that goes on night after night?" The stranger says that the psychologists don’t know what they are talking about. He has lived and died many years into the future, and he knows this because of consecutive dreams more real than his current life. He begins his story by describing himself looking at the shoulder of a beautiful woman, and over her shoulder, at a beautiful view of Capri from a loggia. The white-faced man has never been to Capri in his current life, but his interlocutor has, and is amazed by the accuracy and vividness of his description of its landscapes, of Mount Solano, of I Faraglioni: "Just below us was a rock with an arch worn through it. The blue sea-water broke to green and foam all around the rock..."
The clarity of detail he recalls is amazing. Then there is his sense that the action is constantly moving forward, whether he is conscious of his dreams or not. Four days pass when he does not remember dreams, then he is back on the island of Capri, in a future world, and everything has moved forward by four days. In dream after dream, the solicitor finds himself immersed in the life drama of a powerful man who left government in the “north” to live with his lover on Capri. He is now being urged to go back, because a dangerous demagogue has replaced him and could start a world war. To return, he would have to give up his mistress and he refuses to do this even when she begs him to follow duty and save the world from war. We see the first warplanes (not yet flying in Wells’ time) over the pleasure island. 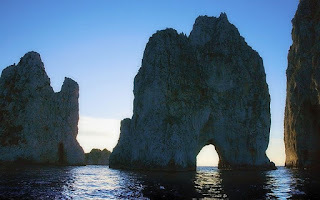 Eventually we see the couple flee Capri and seek safety on the peninsula. They are killed at the ruined temples at Paestum (and again the narrator confirms the description of a man who hasn’t been there in his present life). The solicitor describes dying without pain, followed by blackness and then a desperate and apparently failed attempt to rejoin his love on the Other Side - and then the conversation ends as the train stops at Euston station. The story, written before Kitty Hawk and World War I and moving walkways (also part of the dream of the future), has been admired for its vision of coming technology and man-made catastrophe. It’s also an extraordinary depiction of how in dreams we may inhabit a second life – in this case an unwanted one, in a different body in a different time, in the future rather than the past. The consecutive dreams to which we are called again and again may be full of beauty or terror, mystery or adventure. We want to record them carefully, building memory in our present reality of what is playing in others and capable - with that knowledge - of being ready for the next installment, hopefully capable of making better choices in any world we find ourselves in. Quotations are from "A Dream of Armageddon" by H.G. Wells, first published in Black and White Budget, May-June 1901. When we are passionately engaged in a creative venture - love, art or something else that is really worthwhile - we draw support from other minds and other beings, seen and unseen. According to the direction of our will and desire, and the depth of our work, those minds may include masters from other times and other beings. We draw greater support the greater the challenges involved in our venture. Great spirits love great challenges. I had fellow-scholars, and now it was I and now they who made some discovery. Before the mind’s eye, whether in sleep or waking, came images that one was to discover presently in some book one had never read, and after looking in vain for explanation to the current theory of forgotten personal memory, I came to believe in a Great Memory passing on from generation to generation. The thought was again and again before me that this study had created a contact or mingling with minds who had followed a like study in some other age, and that these minds still saw and thought and chose. 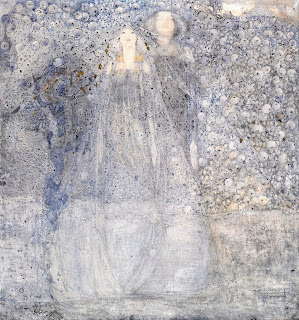 As well as the "mingling with minds" from other times and dimensions, Yeats wrote, with poetic clarity, about relations with the creative spirit he called the daimon. The daimon lends or withholds its immense energy from our lives according to whether we choose the big agenda or the little one. The daimon is bored by our everyday vacillations and compromises and withdraws its presence when we choose against the grand passion and the Life Work, the soul's purpose. On the shortest day of the year, I am down in my creative Cave, once more engaged in reading, transcribing and harvesting from my journals over many decades. There are fantastic dramas here, mythic trouble (and delight) and tremendous trans-temporal adventures in which sometimes I enter the situation of my counterparts in other times, and sometimes they join me in mine. We bring each other gifts and challenges, allies and adversaries from other times and other worlds. 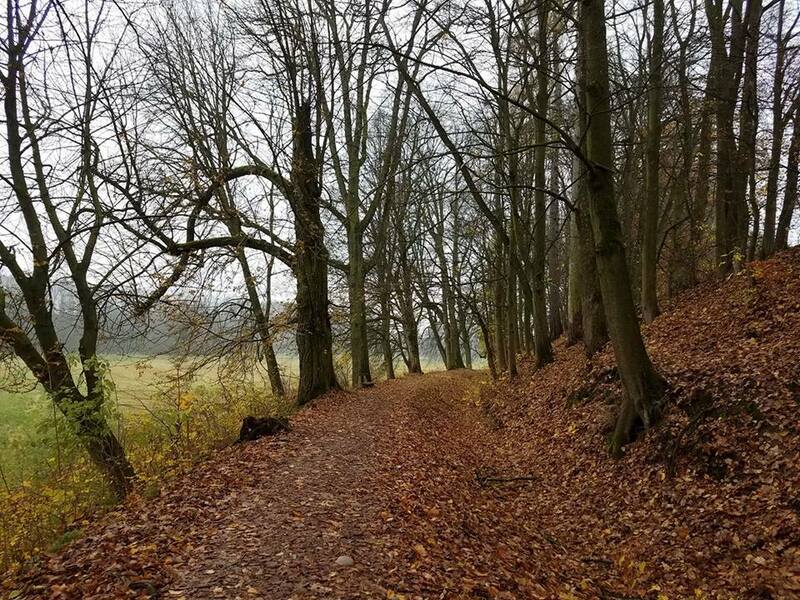 When I read a report of a dream or vision recorded long ago, it comes alive and I am often able to reenter it fully, and make sense of its nature and context with the benefit of what I have learned. Thus I am able to track continuous lives, being lived by my parallel and counterpart selves in other realities, remembered and recorded as dreams. From the viewpoint of those parallel selves, my life in ordinary reality is the dream, or the ghost trail. I feel sympathy and compassion as I monitor how younger Roberts tried to make sense of all this while lacking any really helpful mentor in this reality, and how they struggled to keep body and soul together on the roads of this world. I wonder, as I consider how “past” and “future” aspects of myself looked in on each other and sent each other mental texts, whether my present acts of observation are changing things in, say, 1987-1988. That thought quickens my interest in those journals that aren’t really old. 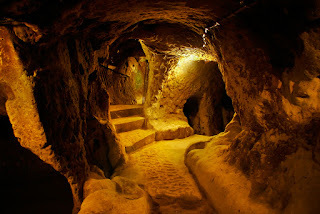 I am in a treasure cave. 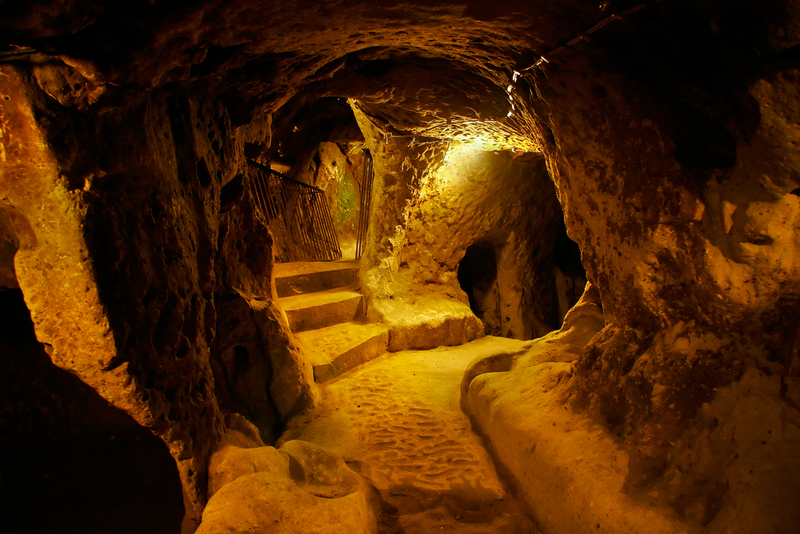 But as in the Indiana Jones type of adventure where the floor gives way and the roof starts to fall when you touch a precious object, there are rather strict limits to how long I can safely remain in the cave, and how much I can bring out, on each visit. 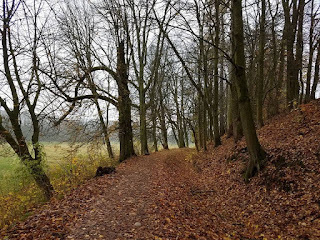 So I move softly and slowly, tiptoeing around the floor in a kind of hopscotch rather than plodding up and down, taking a little from the chest over there, then something from the one on the other side. A raven’s feather, an ancient treatise on the imagining spirit, a Celtic cloak pin, a flying carpet. Nobody knows for sure when Jesus was born, but it is rather unlikely that it was on December 25th. The famous early bishop, Clement of Alexandria, who died in 215, wrote that many Christians in his day believed that Jesus was born in April. December 25 was only recognized as the birthday of Jesus by the Church in Rome in the mid-fourth century, and it took centuries for the date to be adopted by Christian congregations elsewhere. The church in Jerusalem only adopted the date in the 7th century. It took England a century longer. On the other hand, the significance of December 25 in the pagan calendar had long been established. Under The Julian calendar, instituted by command of Julius Caesar in 45 BCE, December 25 was made the date of Bruma, the “shortest” day, meaning the winter solstice. Early European peoples honored the winter solstice as the day of the re-birth of the sun, personified as a god by some, a goddess by others. In 274, the soldier-emperor Aurelian proclaimed that December 25 was the birthday of Sol Invictus, the Unconquered Sun. This was a composite deity he hoped would be acceptable to believers of all persuasions, including the old worshippers of Helios-Apollo and the Roman legionaries who had adopted the cult of Mithras, a god from the East whose birth from a cave was already celebrated on December 25. So the day we now celebrate as Christmas became Dies Natalis Solis Invicti, the Day of the Unconquered Son. It was a custom of the pagans to celebrate on the same 25 December the birthday of the sun, at which they kindled lights in token of festivity. In these solemnities and revelries the Christians also took part. Accordingly when the doctors of the Church perceived that the Christians had a leaning to this festival, they took counsel and resolved that the true Nativity should be solemnized on that day. Syncretism – the bringing together of different strands of belief and custom – was characteristic of the old Roman religions; in the mid-4th century, when the Christian leaders chose to make December 25 the birthday of Jesus, it became an act of Church policy. In a ceiling mosaic in the tomb of the Julii, in the necropolis under St Peter’s, we have an arresting visual image of the convergence of the old solar cult with the new religion. 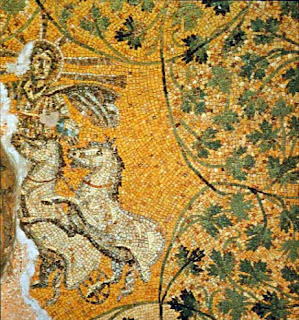 It shows the figure of Sol-Helios, the sun god, riding his chariot. Around 250, his image was touched up, to make the rays around his head resemble a cross. 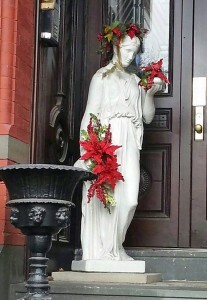 When we look at the customs and symbols of Christmas that are most loved in our families today, we find that many of them are of pagan origin: the Christmas tree, for starters, but also the holy and the ivy, the mistletoe, the yule log, the giving of gifts, the reindeer that fly through the sky. An early Christian grinch in Britain, Polydor Virgil, thundered that “dancing, masques, mummeries, stageplays, and other such Christmas disorders now in use with Christians, were derived from these Roman Saturnalian and Bacchanalian festivals; which should cause all pious Christians eternally to abominate them." The happy news is that the grinches will never win (though I’m not so sure about the retailers). The sun returns, and at Christmas all peoples of good heart will share gifts of light and love. Joyous Solstice, Happy Holidays, Merry Christmas, Natalis Invicti! 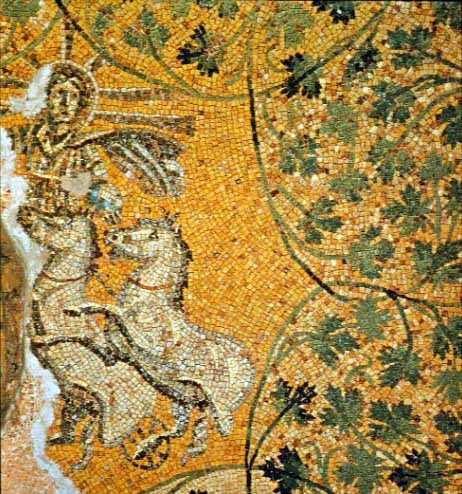 Top image: Sol Invictus in a mosaic in a necropolis under St Peter's in the Vatican. His aura has been touched up to resemble a cross, presumably by Christians who wished to claim his rays for Christ. 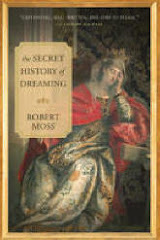 - Adapted from The Secret History of Dreaming by Robert Moss. Published by New World Library. 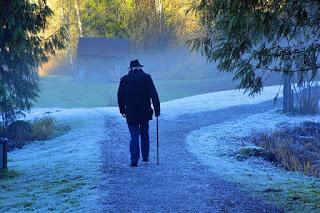 Perennial Jung: "God speaks, chiefly, through dreams and visions"
Near the end of his life, Jung finally managed to put his best and most original ideas in a form that was simple enough to reach a general audience, without diluting or dumbing anything down. He might not have done this except for a dream. 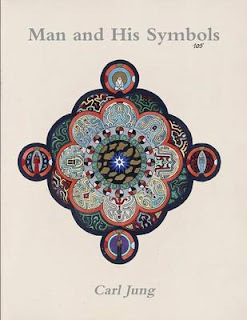 After watching Jung's very human interviews with John Freeman for the BBC in 1959, the publisher of Aldus Books had a bright idea: why not ask Jung to write a book for a general audience? Jung's answer, when approached by Freeman, was a flat No. He was now in his 80s, and did not want to take the time that remained to him for this. Then Jung dreamed that he was standing in a public place and lecturing to a multitude of people who were not only listening with rapt attention but understood what he was saying. The dream changed his mind. Jung had said in Memories, Dreams, Reflections, "All day long I have exciting ideas and thoughts. But I take up in my work only those to which my dreams direct me." Now he proved this, again, by embarking on the book that was published (after his death) as Man and His Symbols. He conceived it a collaborative effort and invited trusted colleagues like Marie-Louise von Franz to contribute chapters. His personal contribution was a long essay titled "Approaching the Unconscious" . The essay is, first and last, about dreams. He completed it just ten days before the start of his final illness, so this work may be called his last testament. 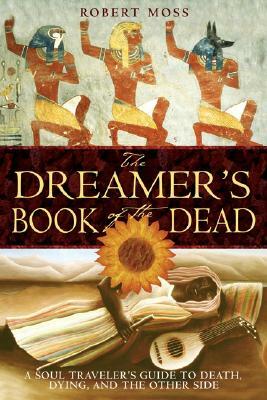 It testifies, above all, to the primary importance of dreams in Jung's psychology and in his vision of human nature and evolution. 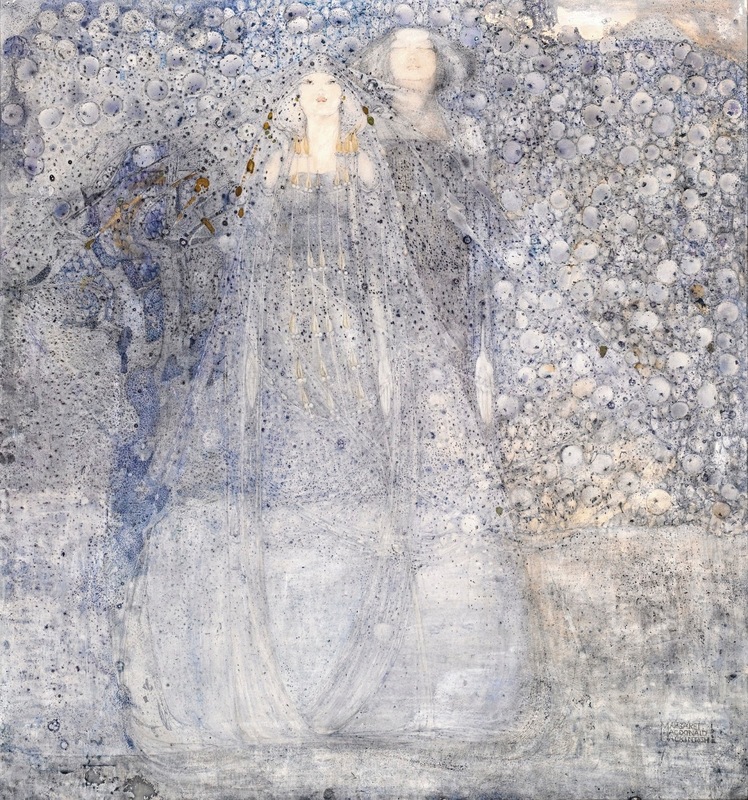 Jung makes this ringing statement: "It is an age-old fact that God speaks, chiefly, through dreams and visions." This could be called a community poem. I wove it from the dreams and memories that came from members of my Soul Recovery Training at Mosswood Hollow when I put the question to them. 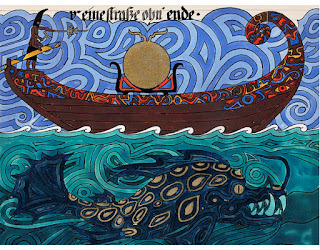 If you choose to venture into Jung's Red Book, I strongly advise you to do so more cautiously than I did. When it was first published, I stayed with it for three days and nights, without much sleep, following Jung on his Underworld journey. There was one moment, in particular, when I became very angry with him.